Stitch a little bluebird on your shoulder and have a zip-a-dee-doo-dah day!!!! 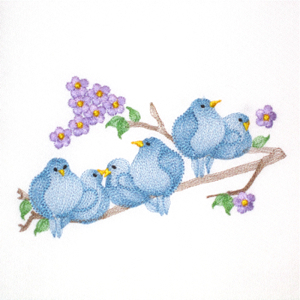 Happiness included with this delightful branch of bluebirds! These 6 adorable birds are perfect for putting a little song of happiness into any project. Digitized in a lightly stitched contoured effect not only makes this design quick to stitch but also allows this design to be stitched on lighter fabrics with great results. Even tees for a cheerful spring & summer look! Cute too for home dec applications from pillows to tea towels & cozies, table linens,valances, placemats & more for a cheery springtime look! Anyone who fancies birds is sure to enjoy this design. Although shown in blue, these birds would be delightful in any color. Try a variegated thread, tone on tone for even more of a contoured effect! The birds have been assigned 3 separate color stops to allow you to stitch in multiple colors to suit your fancy should you desire!